David Magdalene is a prolific Sonoma County writer, poet, performance artist, and good friend to those in the county’s literary scene. He conducted an email interview with me a week or so after a pretty good lunch at Mac’s Deli in downtown Santa Rosa. Many thanks to David for his interest in and support of TVA. 1) Gary, you’ve been working on The Vault Apocalyptia for over twelve years! How does it feel to finally have it finished? It feels good to have people reading it. It took quite a bit longer than twelve years, actually, though there were stretches, sometimes years long, when I didn’t touch it—when I was in school, for instance. I certainly lived with it for a long time. It started as a ten-page short story, written during Reagan’s first term as president. Never when I was writing it. I felt like giving up on it after I finished and was sending it out to agents and small publishers, starting in spring 2010. No one was interested. That was discouraging. But I spent the time waiting for responses to my submissions putting the book through two more revisions, so maybe it’s just as well The Vault got no takers, because it’s a better book than it was seven years ago. I’d imagine you must have experienced many peaks and valleys over the years. Are there any of those experiences you’d like to share with us? It took me a long time to learn the “kill the baby” lesson, which means I went through far too many drafts tinkering with old bits that I should have axed early on. That was a low point—more trench than valley. I try to write sentences to a point where I’m not embarrassed by them. I’m suspect of phrasing that comes easily, and I revise incessantly. Getting a line to that state where I can still find it surprising and fresh after dozens of rereadings, having the right phrasing show itself, those are peaks for me. 2) Okay, so you’ve written a novel—what kind of novel? Not to pigeonhole you, but possible genres that come to mind, for me, anyway, are: experimental, politically satiric, science fiction, socially and culturally critical, historically revisionist. Can you speak to these and any other distinctions you feel important to bring up as they might apply to The Vault Apocalyptia? The book’s a satire—most of its parts are, anyway—and it does dip into different genres and forms, but I think The Vault has to go into that lonely, rarely read “experimental” category. It doesn’t do what novels traditionally do. There are no characters, really, and there is no plot; there are voices and stories, however, and there is movement; the book takes readers somewhere. I guess it’s a novel “by other means.” Maybe there are enough oddities in fiction by now to argue for the creation of new nomenclature. 3) How much was planned? How much “happy accident”? 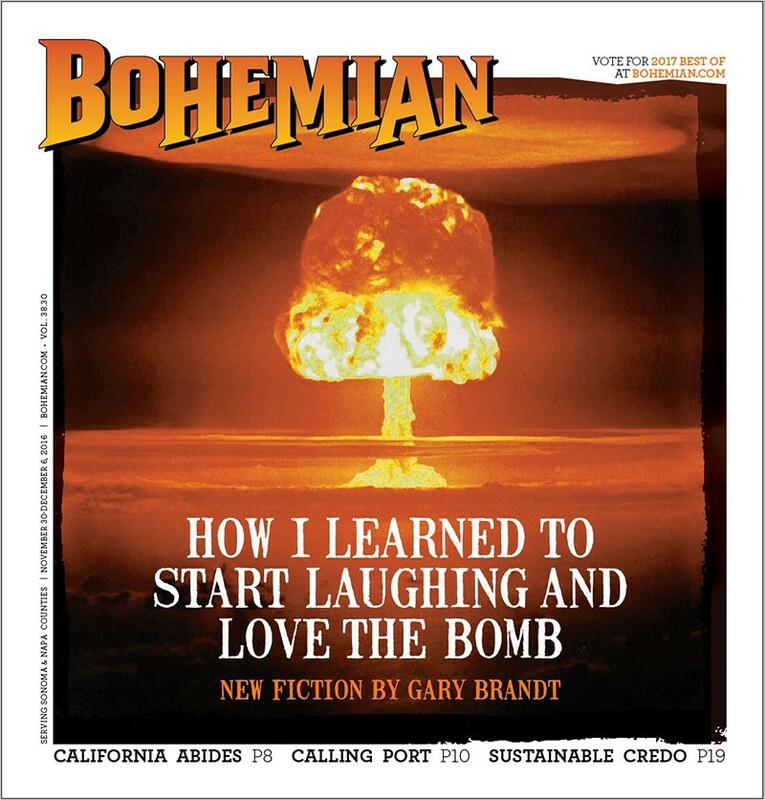 I put together an outline while reading Richard Rhodes’ Making of the Atomic Bomb; I was looking to simply rewrite the short story, but realized there was more I could do with it. At this point, I was still thinking I could get, at the most, a novella out of it. But then I read Rhodes’ sources, which led to more research, which in turn led to other sources. With each wave of research, the project grew. Its larger shape didn’t change so much as it acquired more contour and definition. Somewhere in my reading I came across the story of Reagan’s Deputy of Defense Thomas K. Jones and this infamous civil defense statement he made, the uproar over which got him canned: “If there are enough shovels to go around, everybody’s going to make it.” That line inspired the whole Shovel Gap section, and gave rise to thematic and stylistic counterparts in the Appliance Gap and the War on Milk, all among my favorite parts of the book. So that was a happy accident. Another was discovering that there were whole series of nuclear test shots named after cheese varieties and rat species, which fit perfectly into the RAND Corporation section, where the museum gets overrun by rats. How could you, or anyone else for that matter, manage to write an entire novel without a protagonist? There are still protaganistic and antagonistic forces in it, if that isn’t too much of a cop-out. But really this isn’t that kind of book, and you have to serve your vision. 4) I’d say that The Vault Apocalyptia is timely no matter what, but, unfortunately, perhaps your book has taken on a new urgency with Trump’s tweets when president-elect regarding starting up a new nuclear arms race. What are your thoughts on this? Nixon used to talk about a form of deterrence he called the “madman theory”: make the enemy believe the president is too volatile and unpredictable to provoke. Now it looks like we have a president whose lunacy isn’t theoretical. Like everyone, I’m worried. You always want what you write to be relevant; in the case of a book about nuclear war, the implication of what it means if it’s too relevant is pretty frightening, though. 5) The research that must have gone into your book is mind-boggling; indeed, the nigh Herculean labor that went into your virtuoso turn is evident on every page. Not only the obvious research of the era and its science (and pseudoscience), but the very nomenclature at your command, your use of extensive vocabularies, jargonistic, propagandistic, and otherwise, makes me wonder how much of this book is about language itself. How much of the Cold War would you say was really about language and how language was intentionally mishandled to hide the truth about what was, and wasn’t, really going on? That’s a good question. Language is always one of the weapons in war, probably especially so during the Cold War since, as history likes to point out, no shot was ever fired—at least between the principal players—and with an atomic armory behind it, language took on an unprecedentedly grave weight. The Cuban Missile Crisis, for instance, was also a linguistic event. Since nuclear weapons are such enormously complex devices, it wasn’t that difficult, I don’t think, to make the issues surrounding them appear complex, as well, through obfuscation. There’s a story, referenced in the novel, about Eisenhower instructing the head of the Atomic Energy Commission at the time to “keep the public confused regarding fission and fusion.” Throwing jargon around is an easy trick to make us believe we don’t have enough understanding to take an issue on. I had a lot of fun playing up the “nukespeak” in The Vault. Writing is a form of acting, certainly parody is; you can pretend anything, even expertise, by clothing language in the right way. 6) In a recent conversation we shared, you told me that you had considered doing an online version of your novel using hyperlinks. How would you envision this undertaking, and/or the fruits of such? Also, if I understood you right, each of the nuclear tests conducted in and around our country during the ’40s, ’50s (and ’60s?) had its own code name that you incorporated into your text. Can you give an example of how you did this? The tests went underground in 1963 and ended in 1992; the United States conducted about 1,050 in all, and each was given a name, usually by its primary designer. In addition to the number of them named after rats and cheeses, mentioned above, there were shots named after Native American tribes, wine-grape varietals, New Mexican place-names, mountains, rivers, classic cars . . . Some have simple first names, like Ruth, John, Mike. I thought it would be perversely apt to name the characters after test shots. This was before I’d discovered the full list of them, and after I found that, I had to get all the shots in the book. Sometimes it worked beautifully; the line in the Rube section, “Item: ace stringer Rex Dakota, East Bay Argus scribe,” has five shots in it: Item, Ace, Rex, Dakota, and Argus. But some of the tests were named for pretty obscure things, and I didn’t want to bend the narrative too tortuously to accommodate them, so I ended up cheating a bit, running them backward or as approximations, using homonyms, anagrams . . .
I’ve tucked in all sorts of other Cold War artifacts throughout the book, like operation code names and names of weapons and weapon systems. For one thing, it’s fitting for a path of history that ran in the shadows; reading the novel then is a little like kicking up leaves on the way and finding gravestones underneath. So I’m toying with the idea of putting up an online version of The Vault that has hyperlinks to these bits I’ve buried. But I don’t know—I’m not sure that I want to give it all away. 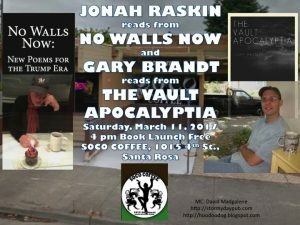 7) Gary, I want it on the record that I think you are one of the most original and creative writers, and that The Vault Apocalyptia is one of the most original and creative novels, that I’ve ever read. I’m not going to say Vonnegut meets Joyce or any of that kind of crap people fling about so handily these days. Gary Brandt is the Gary Brandt of his generation. Or, if you prefer, Gary Brandt is the Gary Brandt of the new millennium. Yet surely you must’ve had a lodestar to help guide you through that long, hard, cold odyssey of the writing of The Vault Apocalyptia? I took permission from some favorite maximalist novels. Alexander Theroux’s Darconville’s Cat and Gilbert Sorrentino’s Mulligan Stew both feature long, frequent sections where the narrative is suspended while the author goes off on a detour; Mulligan Stew is almost entirely constructed out of these. They’re word-drunk books, and you have to really value language over story to appreciate them. And I am a big fan of Joyce. Reading and falling in love with a book like Ulysses makes you want to create something on that scale. Let’s set aside the point of whether or not one has the talent to do it—it excites an ambition. There are stories in Joyce’s biography by Richard Ellman where Joyce’s wife would overhear him in his writing room laughing at his own jokes. So maybe the ambition is just to have as much fun taking on some massive thing as Joyce must have had writing Ulysses. 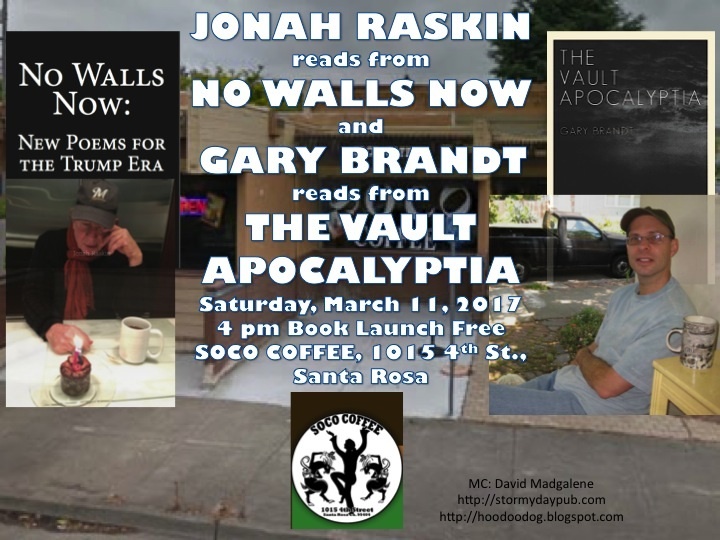 8) Gary, my only criticism, well, disappointment, really, regarding The Vault Apocalyptia was that Ruben Boomerkoff didn’t return, while I kept reading expecting him to pop up again at any given moment. Apparently, the sudden Livermore Laboratory fire explosion that took Rube’s life was, in fact, his demise, corpus delicti or no corpus delicti. Can you tell us Rube fans any more about Rube, how he, as a character in your novel, came to exist? Also anything more about who or what inspired, or helped to inspire, a couple of the other more prominent characters in The Vault Apocalyptia? For example, I’m thinking of the thespian/propagandist par excellence Abel Speed, and the apparently quintessential American girl next door Annie Campbell. I think of Rube as less a person than a personality—and not so much a personality as an exaggeration of traits, cartoonish ones at that. Like all the other characters in the book, he’s a composite, Frankensteined together out of bits of biography from a number of figures—a little bit of Oppenheimer, a little Edward Teller. There’s an often and probably overtold story of how Robert Oppenheimer came to name the first test shot, in July 1945. As he watched it, he said he was recalled to a line in the Bhagavad Gita, “Now I am become death, destroyer of worlds,” and also, more interesting to me, to John Donne’s Fourteenth Holy Sonnet, which begins, “Batter my heart, three person’d God . . . / That I may rise, and stand, o’erthrow mee,’ and bend / Your force, to breake, blowe, burn and make me new.” Oppenheimer named that first shot Trinity, for the Christian trinity of Father, Son, and Holy Ghost. When you read some of the early accounts of atomic explosions, descriptions often touch on the divine, and it started with that first test. So we talked about the novel incorporating all the test names; Trinity, however, is the only one that doesn’t appear in name, though it shows up, everywhere, in other forms: three acts in the musical, three parodies in the Rats section, the three blank pages following the Countdown. And the first three exhibits are designed, as well, to embody that Trinity: Rube as the Father, the builder of the bomb; the miner, soldier, and test site worker as the Sons, the martyred; and the musical as the Holy Ghost, spreading the gospel, the “good news,” of nuclear power. That’s a long explanation of how Rube came to exist; he’s primarily fulfilling one of the book’s structural needs. One of my goals for the book was to touch on every facet of the atomic age. 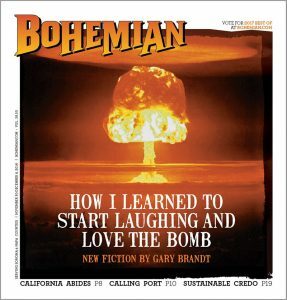 In the ’70s and ’80s, a field of psychology that examined how living with the bomb has affected the American psyche really took off. Annie Campbell is there so I can take a shot at that. The same is true of other characters. I guess it also helps explain one of the book’s shortcomings, which is that its characters aren’t characters. 9) Earlier we discussed different novelistic genres, but, moreover, as far as I can tell, you’ve employed just about every literary genre known to man and woman in The Vault Apocalyptia: poetry, song lyrics, not just dramatic fragments but it looks like you’ve got a full-blown musical in there, you have tales in the Chaucerian sense, captions for photos on a museum wall, algebraic equations, and you’ve elevated footnotes to a new art form, among other things. Yet there’s no sense of mish-mash here; you’ve somehow incredibly managed to fit the pieces together in a way that is stylistically pleasing as well as functioning. Any thoughts or comments you’d care to expound on this aspect of the work? I don’t know about you, but when I read a passage that heavily details a character’s dress or the interior of a room, for instance, for the purpose of accuracy or distinguishability, I just tune out. Maybe I have a poor imagination. But it’s just too much to carry sometimes. A spare, key bit of description can go a long way toward illuminating a scene. I’m reading a lot of Georges Simenon’s mysteries lately, which have very little in the way of overt description, yet I can picture everything. Description presented a different sort of problem with The Vault. I wanted the book to impart that physical sense of moving through a museum’s themed spaces, and dressing up the exhibits in heavily depicted settings is one way I could have done that. But then I would have ended up with very object- and modifier-heavy prose. In the end, no matter what it’s describing, description sounds like description sounds like description. Language is an auditory medium; writing is an aural art. When you want to really register the difference between what in a visual medium might amount to the distinction between red and blue, you manipulate how a passage sounds, which can be done by altering the narrative formally or stylistically. 10) Am I correct in hazarding a guess that you must’ve worked on each of these sections as self-contained units? Am I being presumptuous in asking why you eschewed chapter headings in favor of one long continuous and uninterrupted, for lack of a better word, anti-narrative? I didn’t want actual chapter breaks because that would have popped readers out of the book. The exhibits function as chapters, more or less, and there are pretty clear points where the next exhibit begins, sometimes signpost-clear. I want there to be a disorienting sense of walking into the unknown when you start the book; chapter headings would have given away a little of that mystery. That’s also why there is nothing on the back jacket and no summary on the inside flaps. When The Vault was novella-length, I imagined it appearing on a table of contents with no title (and it had no title yet at that point), just a page number, as though it were this unnamed thing that just dropped itself between the covers of a book. I’d love to have left it unnamed as a novel, but you can’t really do that. What were you thinking, as the reader is counting down the frankly chilling nuclear Armageddon that climaxes The Vault Apocalyptia, by suddenly tossing in the fable of Spunky O’ Sham and the Beeg (or Biggin) Bod Bearly? The moral of the book is in there, and what more fitting way to present a moral than through a faux children’s story? The movie WarGames, which I was heavily influenced by as a teenager—and which, by the way, is referenced all over the place in The Vault—ends with a great climactic line from the WOPR computer, after it runs through every nuclear strategy in its program: “Strange game,” it says. “The only winning move is not to play.” I stole that idea for the thesis of my book, which is also the moral of the atomic age: you lose the arms race by entering it. We may have won the race politically, as we’ve been informed, and that’s important to ideologues, but so what? America lost by polluting its own territory, killing its own citizens, wasting its treasury. We’re living through the atomic apocalypse now—poisoned land, dead patriots, and squandered resources is what it looks like. 11) Gary, let’s say I’m a budding novelist, and I’ve been having real trouble with plotting and character development and the typical things against which a budding novelist runs afoul, and I’ve just read your novel and you’ve blown my mind because I see it doesn’t really have a plot, and it doesn’t even have characters in the traditional sense. All of a sudden, you’ve given me new hope and got me thinking outside the box, but I’m still feeling a little like I’m Spunky O’ Sham. What advice would you give me, a budding novelist, seeking the benefit of your experience and expertise? I don’t think I have expertise. And I’m not sure that taking writing advice is always helpful or that there’s much value, for other writers, in codifying what works for you. Count the number of writers there are and that’s how many ways there are to write. You have to learn what kind of writer you are, how you work, what about it makes you happy and helps you produce work that surprises you. It might mean having to learn how to like writing. There’s an epigram going around that runs something like “Throw the kind of party you want to attend.” The phrase is mutable to all sorts of purposes, so I’ve also heard it as “Write the kind of book you want to read.” But that gets it wrong, I think. It’s so simple that it sounds stupid, but you have to write the kind of book you’re going to enjoy writing. 12) What’s next for Gary Brandt? Something shorter and easier, I hope. After writing my noir parody for the anthology you and Ed Colletti edited, Sons of Noir, I realized just how much I love parody, so I’m working on some pieces that I’d like to compile into a collection. And I have an idea for another novel, too, that I’ve started outlining and writing some drafts for. My plan is for it be, frankly, far less relevant. I don’t want to take on so dark a topic again.